LDE has written a response too based on what self advocates, family members and people who work in organisations have told us. We think all staff should receive face-to-face training which has been designed and delivered primarily by people with learning disabilities and/or autism. We think people with learning disabilities should be employed to design, deliver and evaluate the training. This means they should be paid the living wage and have a proper contract. They should be paid the same amount as any non-disabled co-trainers. There are many programmes that already work using this model and it should be considered best practice, informing and providing the basis for the mandatory training. We asked members what they think about the NHS Long Term plan. 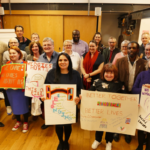 Learning Disability England is working with 5 self-advocacy or human rights organisations as 1 of 7 social movements for better health that Nesta is supporting over the next year. Joe Ulleri was a much loved member of his family, and of the L’Arche Community where he lived. He died in 2016 due to bad health care after a fall. Lots of the hospital staff were kind and good but overall there were problems with the treatment and care he got. An inquest decided that the problems in his care in the NHS were neglect and part of why he died. Joe’s carers did everything they could to support when he was in hospital. His up to date hospital passport went into hospital with him, it showed his likes and dislikes, and, crucially, what his dietary needs were. A 24 hour rota of friends, supporters, volunteers and family were by his bedside throughout his time in hospital. Yet still he died. The hospital passport was ignored. The rota of carers was treated as a nuisance. They were not included in decisions about Joe’s care. They tried to stop the delays and poor communication that were part of his treatment in the Manchester Royal Infirmary but their concerns were not listened to. Joe died of pneumonia, and lack of food. He did not get enough food and nutrition or the right anti biotics. This happened in a modern hospital. We know other people with learning disabilities do not get the right care in hospital and we are hearing more and more examples of when people died because of that. Joe is a person, not a statistic. Like all people he mattered and his death matters. People loved Joe and they have spoken up to remind us that he had a good life and made a difference in his life. Since the inquest into his death his family, friends and supporters have shared statements and stories about what kind of person Joe was and how loved and liked he was. They also said that there must be changes in how health services work – no more reports but action now. At Learning Disability England we read these with sadness and happiness. We are glad to see people reminding us about Joe as a person. He mattered. We hope we can all use these words and these examples of services failing to make the most important change of all – a value placed on the important lives of all fellow citizens, with and without learning disabilities. All people with learning disabilities lives are important. The way care and support happens should be built on that belief. We also support the work to make health and social care systems better including. Mandatory training about learning disability and autism for all healthcare professionals delivered in partnership with self advocates (find out more about that here). We will also keep helping people with learning disabilities speak for themselves or share the stories that show how their lives are important and must be valued. One way we are doing that is working with self advocates from across England on building a self-advocacy movement for better health. Gig Buddies – serious fun – Delivering serious outcomes for people with learning disabilities doesn’t need to be dull! Stay Up Late’s Gig Buddies project matches people with learning disabilities with a volunteer who shares the same cultural interests to help people build stronger informal support networks and make new friendships. 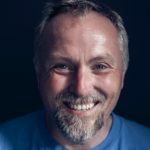 In this session Paul will explain how it works, and how it’s delivering some ‘serious outcomes’ for people in a way that doesn’t feel at all serious, in fact it feels like an awful lot of fun! Paul Richards Paul is a founder, and the director of the charity Stay Up Late. The charity grew out of the experiences of the punk band ‘Heavy Load’ that he played bass with for 15 years. Heavy Load were also the subjects of the feature length documentary movie of the same names (which Mark Kermode rates as one of the top 5 music documentaries of the 21st century!). Stay Up Late also pioneered Gig Buddies, the innovative volunteer befriending project which relieves social isolation through a shared love of the same cultural activities. The model is now being shared across the UK (and Australia). Paul previously worked as the registered manager of a group home for people with learning disabilities and was the Involvement Manager’ for Southdown Housing Association. More recently he was the National Co-production Adviser for Think Local Act Personal. Paul’s passion is ending inequality for people with learning disabilities and when he’s not working he can be found spending too much money in record shops or walking on the South Downs with his family. He has 4 kids and a dog and lives in Hove. In February we told you about the government consultation on the mandatory training and we know lots of members are writing their own responses to this important consultation. LDE is responding too based on what self advocates, family members and people who work in organisations have told us. One of the biggest messages has been that the training should be led by people with learning disabilities and autistic people. Please do share your response if you can so other members know what we are all saying. Thanks for everyone who has so far shared evidence on co delivered training so we can all stand with self advocate trainers who want to make a difference for health services for everyone. We have been talking about the recent news on the actions taken by the police and the regulator (CQC) after the abuse people experienced at Mendip House. Learning Disability England (LDE) believes that organisations that are responsible for the care and support of people with learning disabilities must act in ways that help keep people safe from all kinds of abuse. If they fail to do that those organisations should be accountable and face significant punishment or sanction. If organisations are not held responsible when they fail it sends out the wrong messages about the value of people with learning disabilities in society. As well as organisations being responsible for their part the people who commit abuse should be prosecuted if there are criminal acts, so they take personal responsibility too. We encourage those organisations responsible for poor care and support to use their failure as a learning experience and do better in the future – but this should be alongside public actions that demonstrate how society does not accept the actions of the organisations or any people breaking the law. LDE is concerned that the recent decision to only issue a £4,000 fine for the financial abuse that took place at Mendip House falls well short of what should have happened to show how serious this was. In 2016 Learning Disability England learnt about the abuse that had been happening at Mendip House in Somerset. We heard about it from the CQC report on the service. We wrote to the National Autistic Society telling them about our concerns and asking questions about what they had done. National Autistic Society replied saying they take responsibility for having ‘failed badly’ and would be open about what they were doing to find out what went wrong and how they needed to change how they work. In February 2018 National Autistic Society (NAS) shared an update on what they had done to stop abuse like this happening or to act much quicker when any thing starts going wrong. This was after the Safeguarding Adults Board report came out giving more detail of the dreadful abuse some people living at Mendip House experienced. Last week we heard that the Care Quality Commission (CQC) had fined NAS £4,000. This fine is for NAS not following the regulations on protecting people’s money. It was also confirmed that no staff or organisations are being prosecuted for what happened at Mendip House. The member representatives at Learning Disability England have read the newspaper articles and people’s responses on social media. Learning Disability England exists to work for change. We are left with a lot of questions that we want to find answers to. We will use the answers to help make change happen so people with learning disabilities, autistic people, and their families get access to justice if they do experience problems and people supporting them know the agencies responsible for prosecutions or regulation will act in the best interests of the people they support. Why was there not enough evidence to prosecute? How was evidence gathered by the police or other agencies who do that? Did the people getting evidence use good practice in getting information from autistic people or people who do not use words to communicate? Did CQC use all its powers in this situation? Why has it taken so long for this fine to be decided? What are the rules on sanctions, fines etc. What must happen to result in what sanctions? Did anyone check on what the commissioners organising or buying the support had done and make them change if there were mistakes? We have written to CQC and The Police and Crime Commissioner asking these questions. Click here to see the letter to police and click here to see the letter to CQC. Although it’s been around since 1997, helping significant numbers of individuals with a wide range of different disabilities to buy homes of their own, many people still think HOLD’s too good to be true. So LDE members MySafeHome Limited (who support people who want to buy a home using HOLD) are inviting any questions about this unique Government approved homeownership model that their Managing Director, David Abbey (himself a member of LDE’s Representative Body) will answer in a live webinar. Whatever you want to know about HOLD this is your chance to find out, in fact, the tougher and more in-depth the questions the better! Please email yours to Mariana Ortiz mariana.ortiz@LDEngland.org.uk by Wednesday March 20th 2019 indicating if you’d also like to ask it live on the webinar itself on Friday March 22nd. Even if you don’t have any questions we hope you’ll still join us (or watch later) for a unique and truly no HOLD’s barred webinar! PS: Completely new to HOLD? Visit www.mysafehome.info to find out more or click here to view last year’s introduction to HOLD webinar. David Abbey David Abbey has worked in the financial services sector since 1984 and is a fully qualified Financial Adviser. Back in 1997, he was invited to join a ‘steering group’ to develop a process to enable people with a disability (who also rely on benefits for their income) to buy a home of their own. The result was a unique Government approved shared ownership model, known as HOLD (Home Ownership for people with Long-term Disabilities). David then established MySafeHome Limited to provide everyone involved in helping people with disabilities realise their dream of home ownership with the support they need and to date almost 1,300 individuals have used HOLD to buy their own home. Passionate about the personalisation agenda David is the UK’s subject matter expert in homeownership for people with disabilities and in July 2017 was honoured to be elected to the LDE Representative Body. On 18th February the BBC released some figures that said there are lots more serious incidents and unexpected deaths in supported living. Learning Disability England are worried to hear about any unexpected deaths and serious incidents in supported living as we know it is someone’s life. Seeing how many are reported here makes us very worried, but we are not shocked. We see from the news, from formal reports, and hear from our friends, that too many people with learning disabilities are living a very different life to people without disabilities. Learning disabled people experience far too much different treatment and abuse. Whether this is verbal abuse on public transport, serious sexual assaults in residential care, and everything in between, we know it can happen in every setting where disabled people receive services. We also know that too many people with learning disabilities are dying too young in ways which don’t seem to happen to young people without disabilities. Only a shift to seeing people as fully equal, with rights and lives that matter, will bring about the change we need to see. Some of the increases are because there are more people living in supported living but even so, these things are happening to people with learning disabilities and they shouldn’t be. Some of the increases might be because there is better reporting from providers. We think that being transparent about what goes wrong is a good thing but we are worried that some things go wrong because of poor care or not having enough money for care. BBC File on Four and BBC Breakfast have told stories of poor supported living and 2 stories of good supported living. In one good supported living the money had not been increased for 15 years. Learning Disability England is worried about the lack of funding for social care because there is £7bn less than there was before austerity. We know that care packages, self advocacy and other vital supports are being cut and having a negative impact on our members. We know that some of our provider members have reluctantly handed contracts back because they are not well enough funded. What is worrying is that some providers will still take underfunded contracts and cut corners. We know there are many great examples of good supported living using personal budgets and with providers supporting. Anyone, with the right support can live in their own home and we do not want to see people being made to live in institutional care because of their high support needs. We, along with most other organizations are calling on the government to fund social care properly, but it is about more than funding. We want to see a Social Care Future that works in people’s lives and helps them have rich and rewarding lives, so we will continue to support the #SocialCareFuture initiative. Learning Disability England’s Co Chairs of the Representative Body, Wendy, Scott and Jordan have written to the CQC to ask for more information on the figures presented by the BBC so we can understand what is actually happening. We also ask our members to let us know what they think about Supported Living or any worries or questions they have. We will be sharing our work and questions we have too. We will share the replies we get and what we learn from them.